Zelina “Sally” Kowalchuk (nee Carniato), age 96 years, passed away peacefully in the home she loved on Saturday, March 23, 2019 with her son and daughter by her side. Sally was born January 28, 1923 in Port Arthur, Ontario to Italian immigrant parents Benedetta "Anita" (nee Pasin) and Virginio Carniato (Treviso, Italy). Sally met her future husband John on a blind date arranged by friends Tony and Marie. They dated for two years and then married on November 7, 1942 when she was just 19 years old. Life was never dull for Sally. As a young bride she had a full house...new husband, father-in-law, brother-in-law and an “adopted uncle” John P. all living under one roof. She had to quickly learn the tools of the trade! Sally travelled the world. She was blessed with a loving husband who encouraged her to do what he was unable to do. She shared photos and stories of her adventures with him. She and best friend Ruth Perlin enjoyed travelling together, Hawaii being one of their favourite places. Sally and sister Velina Morgan took many trips together - Italy, England, Spain, Morocco, Australia, New Zealand, Switzerland and the list goes on. Along with their mother Anita they visited relatives in Buenos Aires and went on to explore the wonders of Machu Picchu in South America. They visited relatives in Italy and Anita’s first cousin Monsigneur Alfredo Bruniera. Sally had many hobbies. She loved to swim, go for walks with friends and ride her bike along the Neebing River. She enjoyed cross-country skiing into her early 80’s. Sally worked most of her life: Canada Car in the Inspection Dept. until the end of the War, Chapple’s, Mahon’s in the Drapery Dept. and then at Rutledge’s until retirement. She was a familiar face around town and loved to volunteer whenever and wherever she could: McKellar Hospital, TBRHSC Information Desk, Grandview Lodge Gift Shop, Ortona Legion, DaVinci Centre helping to make gnocchi and crostoli, serving at the spaghetti suppers and helping out at Fiesta Italiana. She was a greeter at St. Agnes Church and served at many funerals and visited the sick in hospital. At the 2013 Volunteer Service Awards she received a 25 Year Award in recognition of her service to the TBRHSC and community. She was a member of the Ladies Auxiliary of the Principe di Piemonte, St. Agnus CWL and Ortona Legion. On October 1, 2017 she moved to the Sister Leila Greco Apartments where she thrived in the upbeat and interactive environment. She attended many concerts and especially loved playing cards with her friends to which they often remarked how often she won! Sally is survived by her son Roger Kowalchuk, daughter Karen Kowalchuk, niece Marnie (Jerry) Hemmings (Brandon), granddaughter Nancy Monchka (nee Kowalchuk), grandsons Mark (Nicole) Kowalchuk (Calgary), and Jason (Dawn) Kruppa, great-niece Ashley Hemmings (Calgary), great-nephew Jordan Hemmings (Winnipeg), and great-grandchildren Sofia and Luka Monchka, and Jonas Kowalchuk, and son-in-law Gerry (Lois) Kruppa. She was predeceased by her parents Anita (Pasin) and Virginio Carniato, husband John Kowalchuk, daughter Claudine Kruppa, brothers John and Dino Carniato, brothers-in-law Wally Kowalchuk and Wally Morgan, sister-in-law Lenore Bettus (Jack) and daughter-in-law Corinne Kowalchuk and sister Velina Morgan in 2013. The family would like to extend their sincere gratitude to Dr. Brian Hartford for his exemplary care of mama. He went above and beyond the call of duty to keep Sally well and attended to her well-being for 32 years. Special thanks to all the wonderful and caring “angels” at Sister Leila Greco who made Sally’s life there so rewarding. She often spoke of how all of you “took really good care of her”. We thank you from the bottom of our hearts and will not name each of you by name for fear we leave out an angel. 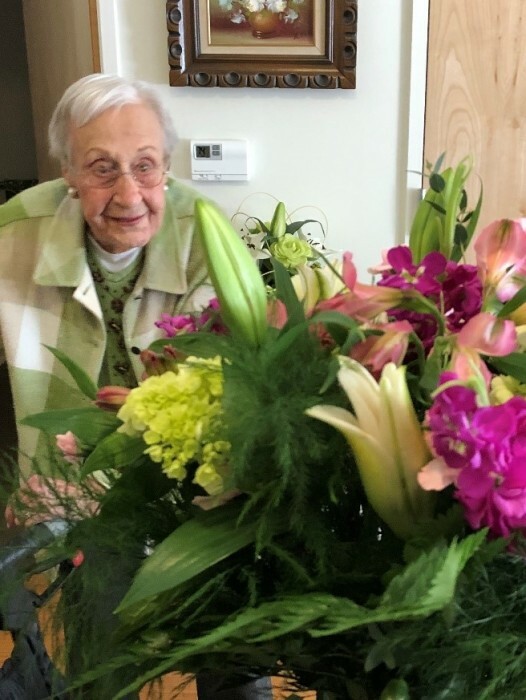 Funeral services for the late Mrs. Zelina “Sally” Kowalchuk will be held on Monday, April 1, 2019 with friends and family gathering at St. Agnes Parish, 2019 Brown Street, for the Funeral Mass at 11:00am celebrated by Fr. James Panikulam. Interment will be in the family plot at Mountain View Cemetery. Should friends so desire, donations to St. Joseph’s Care Group would be greatly appreciated. Zelina Kowalchuk will be remembered in the Blake Funeral Chapel Memorial Grove. Annual dedication service Sunday, June 14, 2020.